Oh, for fucksakes …it’s time for the godamm drum solo. Think I’ll go take a leak and get that beer now. 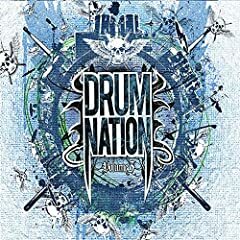 Drum Nation Volume Three showcases the talent of 12 of the hard rock’s best drummers, who play their skin instruments to the sound of a different drummer – Ba-Dum-Bum-Ching! No, you’re not going to hear Neil Peart, Mike Portnoy or the Erlandssen brothers on this record, but there is plenty of good material for the drum clinic-going-technical geeks to sink their teeth into. The entire album, predictably, is instrumental-- the emphasis being on drumming. Volume Three embodies guitar-heavy accompaniment and is great listening, especially for those about (and who are devout) to rock. As I Lay Dying’s Jordan Mancino weighs in with some drumming that separates the men from the boys on “Ahh-The Fade Out” with his As I Lay Dying bandmate Nick Hipa, laying down the guitar work. Chris Adler of Lamb of God kills it. Enough said. Jason Bittner of Shadows Fall methodically, metallically and instinctively beats his drums to smithereens on his 7-minute masterpiece. This guy is one of metal’s finest practitioners of percussion and his emerging talent is coming out of the shadows, brilliantly illuminated on this record. Soulfly’s Joe Nunez plays a track that, by itself, makes this record a worthwhile purchase. Raanen Bozzio, son of legendary drummer Terry Bozzio, throws in an exotic flavor of jazzy, offbeat playing with “Impulse”, which is probably the least metallic-sounding offering on the album, but the young Bozzio’s drumming is nothing short of captivating. Drum Nation Volume Three would be a perfect extreme sports soundtrack. Quite motivational, it would also be the perfect stuff to have playing in your head while running from the cops. 5. Jason Bittner – Instr.